The Supreme Court of Spain condemns four members of the Association of Cannabis Consumers Pannagh to imprisonment in a judgment full of errors and contradictions. In addition to the prison terms, they have been condemned to fines of 250,000 euros in total, despite considering that no enrichment has taken place. Facing charges of “hiding their true aims” the members of Pannagh wish to declare that they count with several favorable legal precedents and they have contacted various public institutions. The Criminal Law Chamber of the Supreme Court partially upheld the appeal by the prosecution against the earlier judgment of the Court of Biscay that acquitted the members of Pannagh of the crime of drug trafficking in March 2015. Now, the Supreme Court declared a prison sentence of one year and eight months and fines of 250,000 euros for the chairman and the secretary, and six months and one day in the case of the two members who had been found working in the packaging of the harvest. The treasurer was acquitted due to a failure of the Court. To condemn the other four defendants, the Supreme Court has used arguments riddled with errors and glaring contradictions, and also ignores fundamental facts on the cause that are relevant to the defense. According to Pannagh, the sentence is clearly political, aimed at dismantling the cannabis associations, and based on a totally distorted vision that is out of sync with the social reality of cannabis in Spain. It is said that the convicted acted “encouraged by the unfounded hope that his performance might be tolerated or that some courts might accept the thesis that these facts are of legally irrelevant”, ignoring the fact that the activities of Pannagh were considered irrelevant by the Provincial Court of Biscay in 2006 (Order No. 218/06) and of Alava in 2012 (Order No. 377/12), which in both cases led to the return of the cannabis that was seized. Therefore, those who were condemned today did not have a “pious hope”, but the certainty, based on criminal records, that their conduct was not criminal. It was also said that the association was “hiding its real purpose” and “acting indifferent” to the possible illegality. Thus it ignores the initiatives taken by Pannagh to request clarity from various institutions such as the Basque Parliament, which among other things led to the creation of a parliamentary commission on the issue, despite the fact that both these initiatives and the verdicts of the provincial courts were mentioned during the preliminary investigation and the allegations were made by the defense in the appeal stage. The new ruling merely reproduces almost literally the ones given prior to the associations Ebers, Bilbao, and Three Monkeys, Barcelona. The copy is so literal that those who were convicted today were incriminated due to issues supposedly described in the statutes of Pannagh, when in fact they relate to those of the other condemned associations. Most striking is the fact that the real purpose of Pannagh can be read in the introduction of the verdict and all can clearly see that these do not coincide at all with what is said in the verdict. These types of errors are repeated in several points, with the result that the description of the facts is seriously altered. As it comes from a Court of Appeal, the new decision must be based on a new legal assessment of the facts that were deemed proven in the judgment under appeal, facts that can not be changed. However, the changes are numerous, decisive and, above all, contrary to the law that assures the right to a fair trial. In addition, new evidence has been introduced without a hearing where the parties could have commented them. It condemns the members of Pannagh based on, among other things, matters that they we were ’supposed to know’ or on our alleged intentions. None of these issues were raised at the trial. As a result the Supreme Court has not heard the accused before condemning them, as is required by law. However, surprisingly, the judgment of the Supreme Court flatly states that “a small group of people organizes and directs the membership structure; and they prepare the organisation, supply, distribution, control, cultivation, facilitating such structures to serve a broad and indiscriminate user group “. Thus, the sentence lacks the required respect for the established facts, which, as we have seen, say otherwise: it was the Pannagh association, not an “indiscriminate group” but a legally constituted entity with clearly identified members, that decided to create such structures and hired the now condemned to implement them as employees. Those convicted have announced their intention to file a motion for dismissal before the Supreme Court prior to presenting an appeal before the Constitutional Court, as they feel that, among other things, their right to presumption of innocence, to a process with due guarantees and to proportionality in the sentencing have been violated. They have also announced their intention to appeal to the European Court of Human Rights in Strasbourg if necessary. In the coming days, Pannagh will organise a press conference along with representatives of other cannabis associations to assess the verdict and announce initiatives to denounce this outrage. Pannagh wants to stress that workers of the association have been punished for activities that, as was demonstrated in the trial and thus recorded in the revoked decision, were the initiative and responsibility of all of its members, according to its statutes and following an agreement decided by the general assembly. Five members have been accused of criminal association; this accusation has been dismissed, but eventually the Supreme Court has ordered the confiscation of money from the accounts of Pannagh as if the membership had been a mere display of the accused to commit crimes when in fact the evidence shows otherwise. 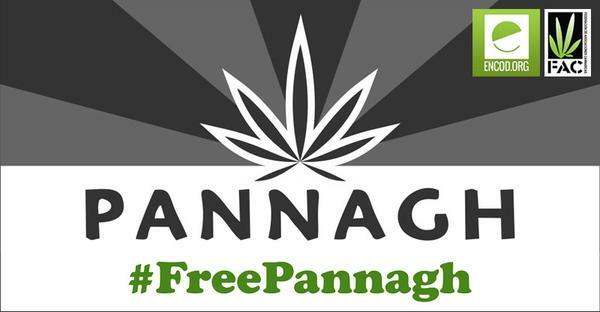 Finally, Pannagh encourages all of you to continue fighting for a change in drug policy to end the current situation of injustice and to continue the hopeful debate on cannabis regulation that is occurring in much of the world, to which Pannagh has tried to contribute since its founding in 2003. The post Press Statement by the Pannagh Association appeared first on Sensi Seeds English Blog.